Lifecolor Work hard for your garden, make every effort to solve your water pipes and all the ultimate expansion for the water hose! Hose is a must for easy outdoor work. You may have been tired of the traditional poor quality plastic hose, hoping to get a longer life. We upgrade the hose to the highest quality for the best possible user experience. Hose expansion Please note that the length of the hose varies with water pressure. The 100-feet expansion of the water pipe will expand its original length by 3 times so that you can comfortably move in every corner of your garden and water. More importantly, this garden water pipe flexible, lightweight, no kink design will allow you to easily carry, you can avoid every need to use the trouble. Last but not least, this retractable garden hose is very easy to store, and if no more water will shrink back to its original size. Lifecolor Durable material and 9 set the nozzle.The latex core and rugged brass ends ensure the longest service life. 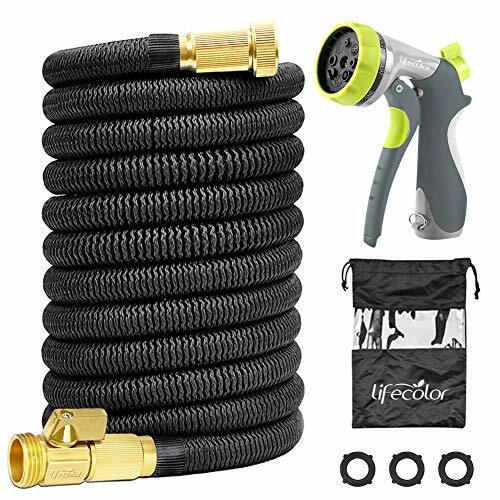 In addition, the 9-pattern nozzles and simple on / off switches will help you use this garden hose for many different purposes, including watering, car washing, window cleaning, boat deck cleaning and so on. ☎DO YOU WANT TO MAKE WATERING MUCH EASIER??? This garden hose will never let you down!!! Latest double latex core and 3750 denier high-density woven casing=sturdy maternity and light weight;Solid 3/4 Inches brass connectors=leak-free watering. The ONLY Expanding Hose That You Will Actually Easy to Use When In Use Under USA Standard Water Pressure. ☎FLEXIBLE DESIGN: This expandable water hose starts our from 33 Feet, when the water is turned on the hose quickly expands up to 3 times in length (100 Feet) with the water pressure (3-12 Bar) and returns in minutes to its original length when the water is out. Just make sure there is enough water pressure to expand the hose Just make sure there is enough water pressure to expand the hose.Temperature 41℉-113℉ - this garden hose for long-term use. ☎FREE 9 PATTERN SPRAY NOZZLE: With a 100-feet expansion of the water pipe, you will receive a very convenient 9-pattern nozzle that will have the opportunity to be used for many different purposes. Give your garden watering, car wash, give your pet a cool shower, or clean your outdoor windows in the easiest way! ☎EASILY STORAGE: Comes with a free storage bag, just drain water from the hose when not in use, put in the bag or box and STORE OUT OF DIRET SUN(Kindly tips!). Save lots of your space and need not to worry about disorder hose any more. Besides that, the water hose in the bag can serve as a USEFUL GIFT for all gardeners. ☎SATISFACTION 100% GUARANTEE: Our products have 12 month replacement warranty and service satisfaction guarantee. Please feel free to CONTACT US if you have any problems, and we will always be there to help you. If you have any questions about this product by lifecolor, contact us by completing and submitting the form below. If you are looking for a specif part number, please include it with your message.